MIG welding is the handy hot glue, do-all kind of welding–the type of machine you will most likely run into at any metal shop in the US. 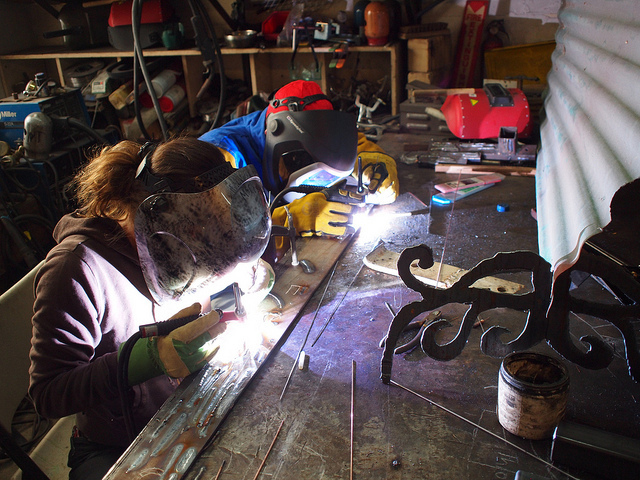 This class focuses on the hands-on experience of welding. 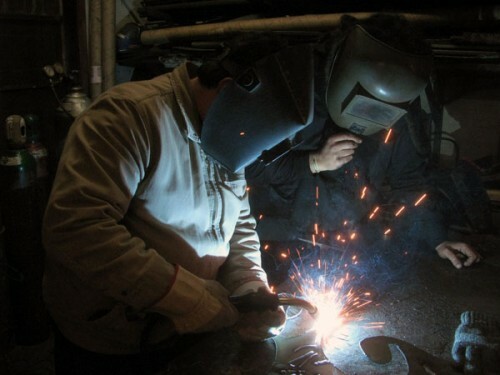 You will learn the difference between MIG, TIG, arc and oxy acetylene, what type of shielding gas to use for MIG, why you won’t get electrocuted, and how to run a bead… a little of the theory and tech, but mostly you will get a feel for the manual skill of welding. You can take this beginning welding multiple times with different teachers and you should! What is common to every class? Welding is about practice. TIG is the new MIG. The coolest thing about TIG welding is that TIG allows you to see exactly what is going on as a weld is executed, up close and personal, without being showered in splatter. Plus you don’t have to wear those bulky gloves. Come down to the shop and do it slow with Hackett. For all classes: Wear jeans, long sleeves and sturdy shoes or boots. Leave your fancy nylon sneakers at home. They will get ruined and your toes may burn off. You’ve been warned. Dress for the weather. If it’s cold outside, it’s cold inside. This is a working shop so prepare to get dirty. *If you’re looking to make-up a rescheduled combo MIG/TIG class, try March 15th, when there’s both a MIG and TIG class– sign up for both with the “make-up/reschedule” ticket type! This entry was posted in Classes and tagged homepage. Bookmark the permalink. Comments are closed, but you can leave a trackback: Trackback URL.